On the surface, their sole purpose is to replace your stock watch bands with something that better suits your style. You have the choice between silicone or leather and the price ranges from $49 to $59 (about £35 to £41, AU$66 to AU$77,) respectively. And each band material is offered with a variety of svelte color options to select from. I was eager to give Mode a try, so I elected a few recent Android Wear smartwatches, the Huawei Watch, LG Watch Urbane and the Fossil Q Founder as candidates for a makeover. After all, I was getting a little (very) tired of the black leather and stainless steel bands. 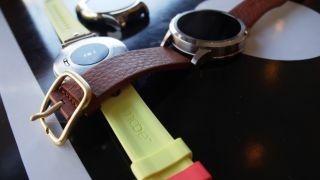 Techradar was provided with the 18mm fluro yellow model that fits the Huawei Watch and the 22mm brown leather band for the LG Watch Urbane. Google's site for Mode removes the guesswork by pairing you up with the correctly-sized band for the smartwatch that you own. Removing the old bands and installing the new Mode bands was as simple as I could have hoped. And within minutes, these old watches felt new again. So that's it, right? Is there more to Mode? This is where I pause to take a step back for a moment. There are now two third-party products sitting on my desk that have first-party accessories strapped to them. When has Google ever released a set of accessories that worked across a swath of devices made by other manufacturers? To my knowledge, never. Looking back, stuff made in-house, like the Live Cases for the Nexus 5X, Nexus 6 and Nexus 6P, and the keyboard covers for the Pixel C and Nexus 9, has always been done so exclusively for Google's own products. And as cool as these accessories might be, they each come with an asterisk, as they aren't compatible with any other products on the market. You could say that Google's less-than-inclusive behavior suggests that it wants its creations to be the brightest showcase of what Android has to offer. But if that's the case, this move with Mode is saying the opposite in so many words. That it wants to standardize all of its Android Wear smartwatches to the same level of pizazz. But why? And why now? It could really be for a number of reasons. Maybe Google wants to put Android Wear in a better position to take on Apple Watch (and its successor) along with its ample selection of easy-to-swap Apple Watch bands. Or because Google seeks to work more closely with third-party manufacturers from here on out. You can't forget about the fashion industry, too, which the Apple Watch got quite the strong hold of during its launch, and after it, with designer straps from the likes of Hermes and Coach hoping to elevate the device to catwalk status. Lastly, with Snapdragon Wear 2100 arriving sooner than later, Google might want to see the occasion as a sort of reintroduction to Android Wear. These slimmer, more battery efficient smartwatches will be the perfect showcases for a fresh coat of Mode. As easy as it would be dismiss Mode as just a one-off accessory, you shouldn't ignore this one. A move this big from Google in a sector growing as explosively as wearables definitely deserves its fair share of prodding. I'm getting the sense that these straps of silicon and leather are hinting at something much bigger for Android Wear than Google is leading on. If that's the case, we'll find out at Google IO 2016. But today, Mode bands are just that: bands. You remove your old ones, pop these on and that's about it. Worst case scenario: Mode bands for Android Wear are simply a refreshing bit of attention paid to its adopters. And if that's all we get, is that really so bad?